We had a date night Friday evening! We ate dinner at Longhorn Steakhouse. And OH MY was it yummy! We had a gift card and a coupon for a free appetizer, so we went a bit more extravagant on our meals than normal. Tyler got this steak stuffed with crab and topped with a lobster tail. And it was amazing. So was their bread. Can’t wait to go back! 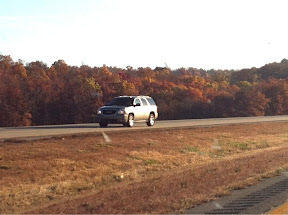 We had a beautiful drive home with the fall foliage! We had a low-key evening Saturday. I grilled burgers at home and mom helped me do some cleaning and organizing (thanks mom!). Sunday, I did my first week serving in the nursery! After a close call (I didn’t know I was on the schedule…but luckily a friend called to check and make sure I was coming), and another close call (I must have turned my alarm off without really waking up…and we overslept a whole hour! ), mom joined me and we worked in the “crawler/toddler” room. They were about 9-12 months and so sweet. I even changed all 5 of their diapers! I don’t have tons of baby experience…and I think that those 5 diapers were more diapers than I have ever changed before. ha! I look forward to loving on some more sweet babies in the future! 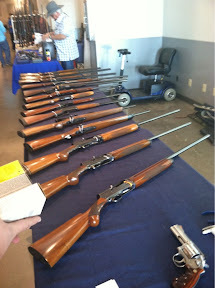 After lunch, mom went home….and Tyler dragged took me to the Gun and Knife show in town. There were lots of guns, knives, some pawn shop jewelry, lots of hunting gear, and more. He bought an AR 15 gun. It was expensive, but he got a good deal on it. He has wanted one for a long time…so I was glad he found one he liked at a good price. It’s a hoss of a gun. It is so well made, that even though its a giant gun with big bullets…the recoil is minimal. I shot it and loved it. Sunday evening, we ate leftover burgers and Tyler helped me clean. I’m so thankful for him! He vacuumed the whole house so I could do some steam cleaning in the kitchen. I did the counters, some detail work on the track of the sliding glass door, and then steamed the whole kitchen floor. He was such a helper to vacuum for me! It was a great weekend! 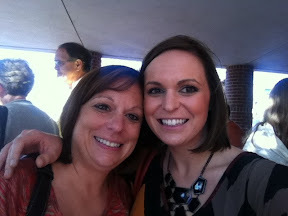 Good time with my momma, a fun date night with my man, some shopping, some cleaning, and some relaxing time. Love that! This week I’ll be busy trying to do some last-minute training for a 5k next Sunday. I don’t expect to run the whole thing…but I’m going to try! I’m glad I have the house clean and laundry done so I can focus on everything else this week. How was your weekend? Have you ever shot a gun? I hadn’t until I met my wonderful husband. Same with me, I hadn’t shot a gun until I met my husband either! Funny how things change. Oh yes! I never dreamt I would do some of the “country” things he has introduced me to! But I love it! Fun weekend!!! 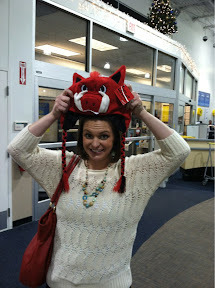 LOVE the razorback hat!!! Oh yum! I’ll have to be on the lookout for that next time we go. How was Taste of FS? I wanted to go…but between work and Zumba didn’t have the time. Yay for voting, shopping, guns and hog hats!!! Maybe your honey will surprise you with it! Then we can be twinsies! 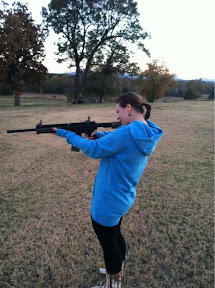 And yes, I shoot guns, though I don’t enjoy it! 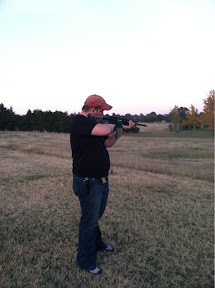 But our gun club has a rule that shooters can’t be out there alone, so I go and supervise my hubby! *wink* When I’ve had enough, i put on earmuffs and read a book! Ha! Trust me, it is SO NOT fancy! There’s an outhouse on the property! Ha! We went to the sat 2:00 Shrek! A guy proposed before the show! !